SUM students from the main campus and from across our nation (& from our foreign sites) converge on the city of New Orleans each year. This explosive 6-day gathering consist of a Visionary Leadership Conference and our street evangelism outreach. Students are empowered by the Holy Spirit through worship, prayer and preaching of God’s Word by dynamic Visionary Leaders. 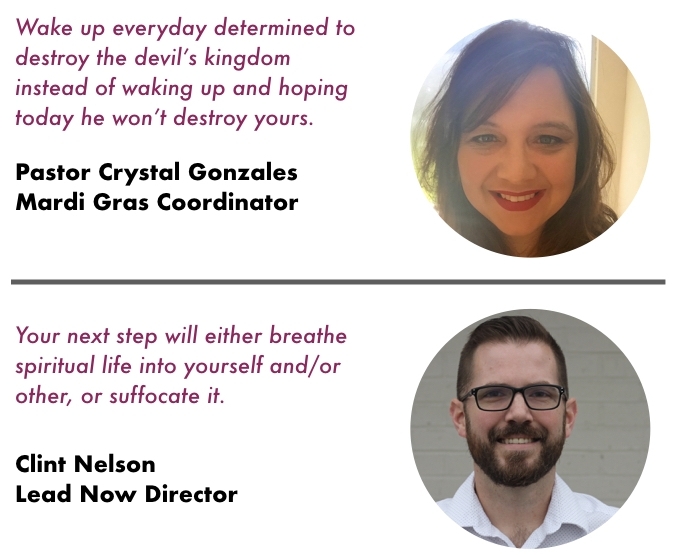 Lead Now participants take part in a 6-day conference and outreach which takes places during Mardi Gras festivities in New Orleans, Louisiana. The Bible declares that, "now is the day of salvation" (2 Corinthians 6:2). It was Jesus' mission was to "seek and save" those who are spiritual loss. We invite others who also realize the sense of urgency regarding bringing Christ's message of hope to a hurting and dying world. Students gather as the army of God and share their faith with lost and hurting people. SUM’s Mardi Gras Outreach is an environment that honors God and encourages spiritual growth. Student leaders and SUM staff provide strong, caring, Christian discipleship in a heart-softening and safe atmosphere. We are praying for each attendee as they prepare for their time with us each winter. Lives are changed every year during Mardi Gras! We look forward to you joining us in this adventure! General sessions and the Visionary Leader Conference is held at the Copeland Tower Suites located at 2601 Severn Ave., Metairie, LA 70002. We offer opportunities for SUM friends and family to serve. 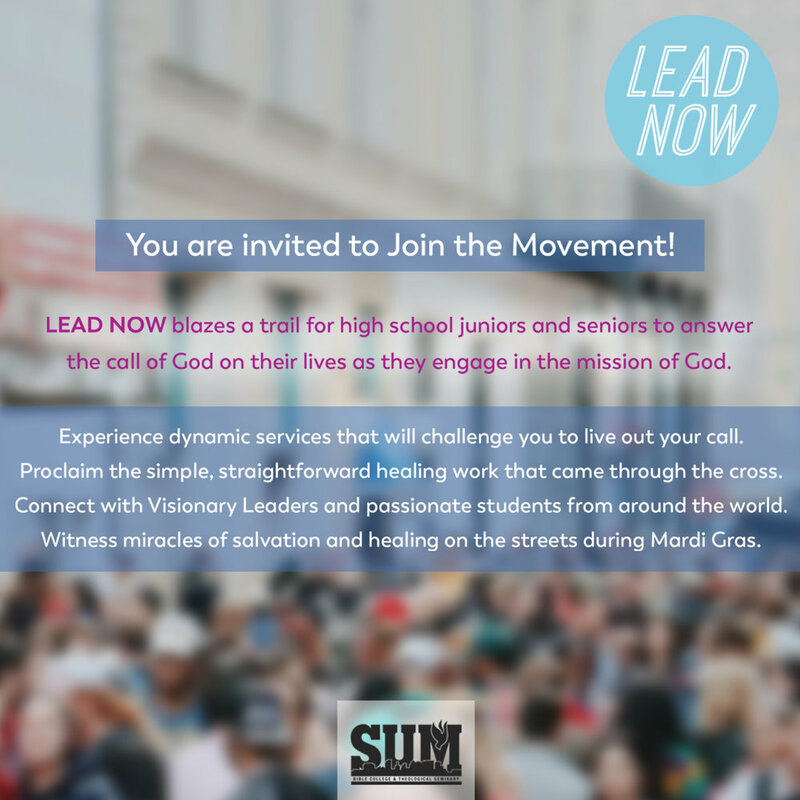 Lead Now is a ministry of SUM Bible College & Theological Seminary (SUM). SUM equips indigenous leaders from America and the nations of the world by offering an affordable theological education combining academic instruction with practical hands-on ministry and personal mentorship. Our mission empowers these leaders to be instruments of change in their communities. SUM is dedicated to Empowering Leaders for the Fivefold Ministry. The cost includes lodging and dinners. It does not include travel costs. Consider this amazing opportunity to go on a missions trip alongside a large group of college students and missional leaders from many cities of the U.S. and abroad. 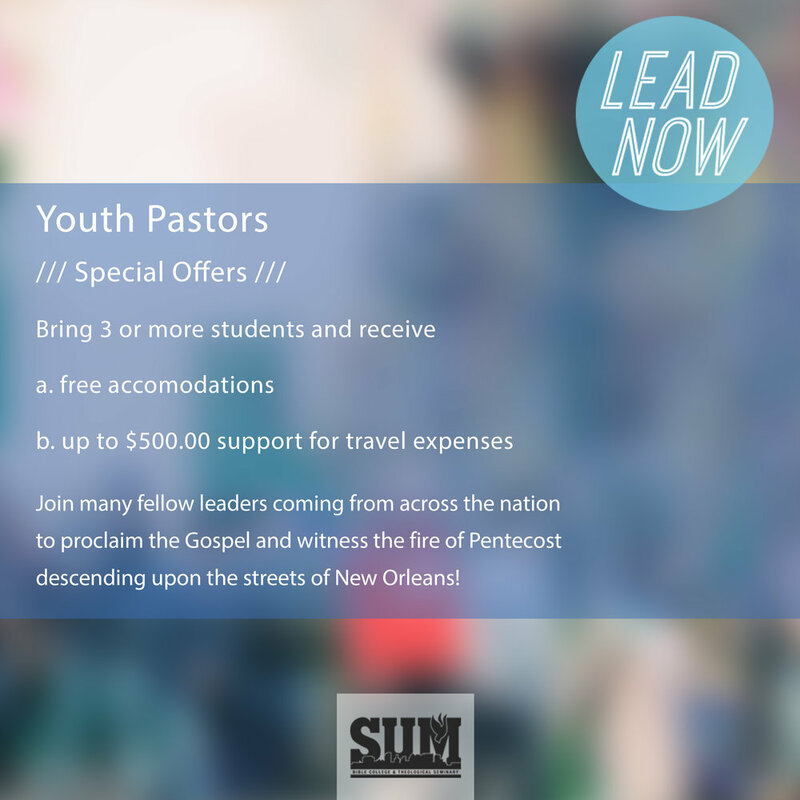 Join with fellow leaders to proclaim the gospel and witness the fire of the Holy Spirit descend upon the streets of New Orleans! SUM allows open enrollment for 200 junior and senior high school guests (at least 16 years of age). 25 third-year student leaders, youth pastors and staff will serve these future leaders-in-training. Have questions? 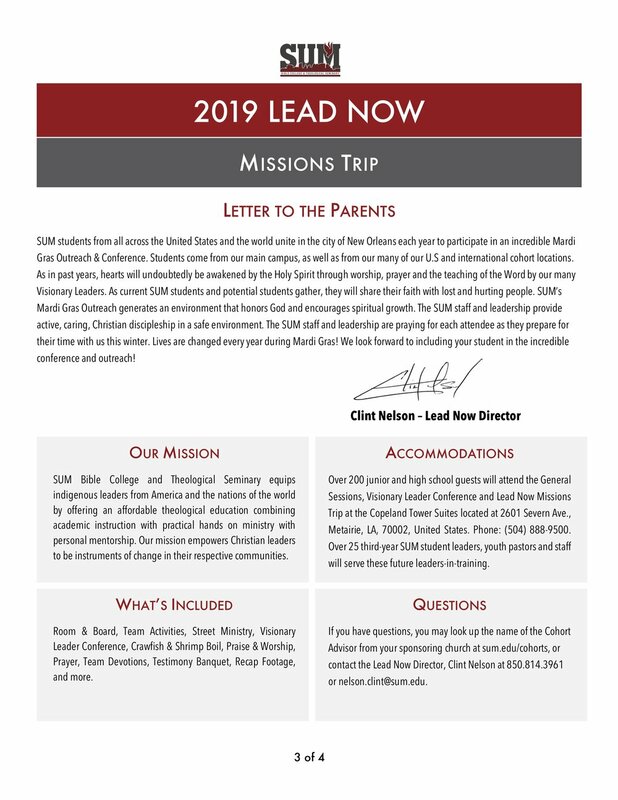 Please contact one of our Cohort Advisors, or the Lead Now Director, Clint Nelson, at 850.814.3961 or by email via nelson.clint@sum.edu, who oversees the needs of each student guest. 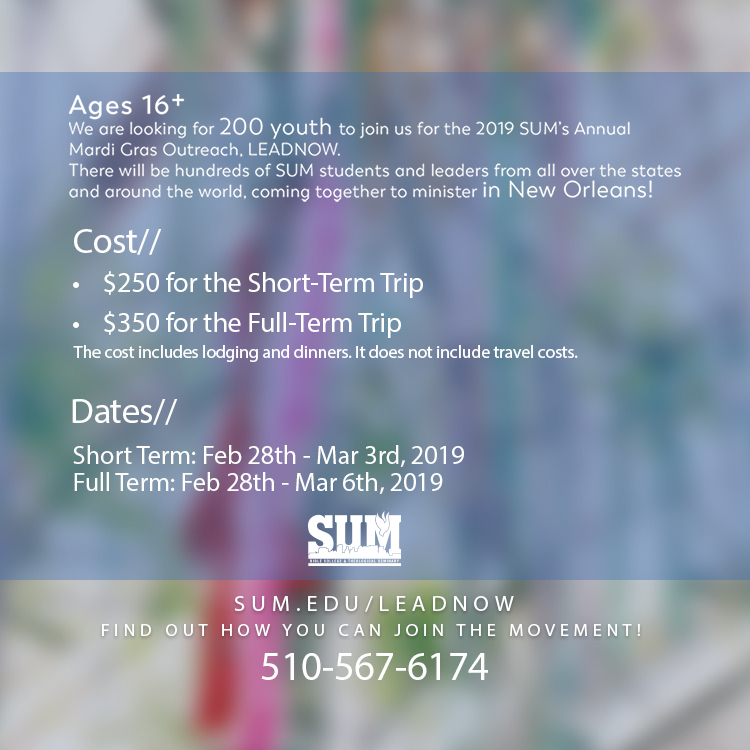 High school and college-aged guests may share this letter to their supervisors as proof of their attendance of SUM's 2018 Mardi Gras Outreach & Conference. 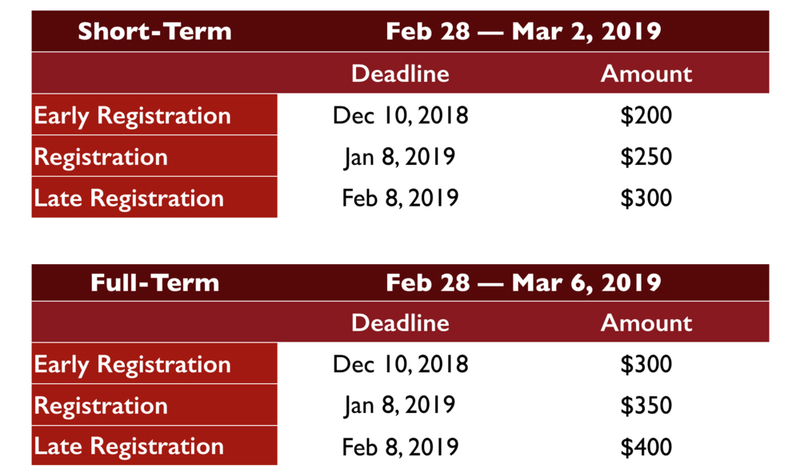 Please fill out the registration form here, or click the image below to complete. Special Offer: Bring 3 or more high school students, and a youth pastor may receive (a) free accommodations, OR (b) up to $500 support on travel expenses paid for by the local cohort. Please fill out this Youth Pastor Registration form.